When you are president, everything matters, even the little things that are normal for less-watched mortals. If you change your walking gait, it’s a new swag you have adopted and if you don’t close your eyes during prayer, it’s such a big deal. That’s the situation President Uhuru Kenyatta found himself in last week after meeting a prominent Kenyan media personality and greeting her in the best way he knows how: through a hug! The occasion was the fourth session of the United Nations Environment Assembly at the UN office in Gigiri, Nairobi, where President Uhuru chanced on the former CNN journalist, who later moderated one of the events. Images of the meeting show the two embraced each other ‘deeply’ as other leaders including Opposition chief Raila Odinga watched on in an unspoken passion that would rattle a spouse. Uhuru and Zain exchanged pleasantries and shared laughs, though it’s not clear what they talked about. Zain Verjee worked for Capital FM and KTN before leaving for CNN. After a 14-year stay at the US-based Cable News Network, she quit to form her own Africa-focused production house in April 2014. A normal hug would have passed, but many have described it as “hearty” given that it took longer. When it hit social media, Kenyans made light of it, even proposing the president should have allowed Raila a chance for a hug in the spirit of the handshake. “President Uhuru Kenyatta’s HUG-SHAKE has left most Kenyans on social media tongue wagging,” someone commented on Twitter. For Zain, the hug may not a big deal, after all. Having brushed shoulders with world leaders, she must be used to such VIP hugs. President Uhuru, it seems, loves greeting and, now hugging. He is often seen greeting different kinds of people at events, in what is seen as his way of demystifying the presidency. In 2016, his photo while hugging an old woman in Kiambu during a Last Mile power connection inspection tour left most Kenyans humbled [ Granny gives Uhuru a motherly hug]. Tucker Newton gets a mighty hug from President Trump in North Carolina after asking for one. Presidential hugs for non-VIPs are rare but not uncommon. In October last year rapper Kanye West hugged US President Donald Trump during a White House Visit. 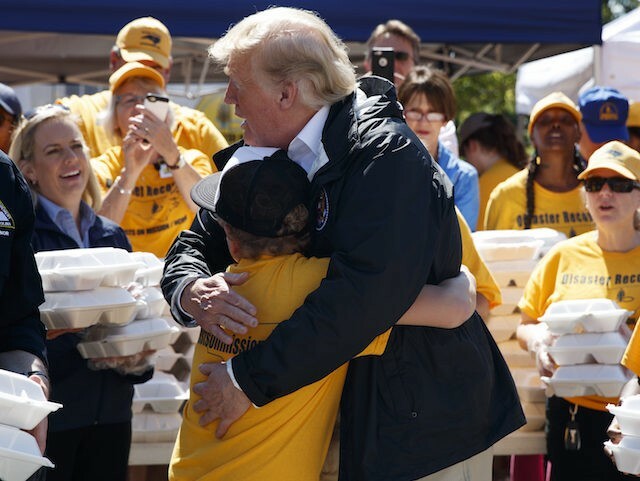 Earlier in September, a boy by the name Tucker Newton who was in the team serving hot meals to victims of Harricane Florence in North Carolina asked for a hug from President Trump, who had joined them in the humanitarian exercise, and he got it – a really big one. And another boy who made multiple attempts to hug President Trump as he signed the Right to Try Act, finally got his bargain with three multiple hugs from the President of the world’s superpower.